Ipswich Town made it nine draws in 12 games as they hit back to deny Birmingham the win at Portman Road. Jonathan Grounds fired into the roof of the net to put Blues ahead after Bartosz Bialkowski saved Lukas Jutkiewicz's initial shot. Jutkiewicz almost doubled the lead when put through by Craig Gardner's reverse pass, but Bialkowski saved well. Town's equaliser had a touch of good fortune when Grant Ward's overhit cross flew over Tomasz Kuszczak into the net. Freddie Sears should have opened the scoring for Town, who are winless in eight matches, but fired straight at the legs of Kuszczak, and then had a goal ruled out for offside. 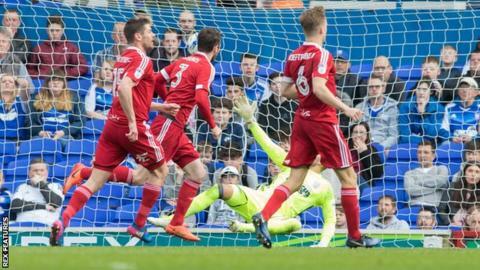 But Birmingham, who have won just twice in 20 matches since Gianfranco Zola took over as manager, created chances to secure their fifth away win of the season. David Davis was inches away from connecting with Jutkiewicz's low cross before Bialkowski made a fine save to keep out David McGoldrick's header towards his own goal. Ipswich substitute Kevin Bru went close late on to what would have been only a second win in 13 matches, but his curling shot was narrowly wide. The Tractor Boys' fifth successive home draw keeps them 17th, a place above Birmingham on goal difference, with both sides six points above the relegation zone. Ipswich manager Mick McCarthy: "I don't want to be involved in a relegation fight. We've got to get enough points and stay in the league. "I thought the first half was a Championship scrap that we probably shaded, but we lost all our momentum for giving a poor goal away. "Bartosz Bialkowski kept us in it and we weren't playing well. It was a horrible atmosphere and we got away with a wonder-strike, or a lucky cross, to get a point." Birmingham manager Gianfranco Zola told BBC WM: "We looked like we were cruising. We scored a goal and I didn't see them scoring because we were defending very well. "We had a couple of great chances, but we didn't convert. It is a pity because probably we deserved a little bit more. "They [the players] fought very hard today - a lot of players have run a lot - so it will be important to recover quickly." Attempt missed. Kevin Bru (Ipswich Town) right footed shot from outside the box misses to the left following a corner. Corner, Ipswich Town. Conceded by Krystian Bielik. Corner, Birmingham City. Conceded by Bartosz Bialkowski. Substitution, Birmingham City. Stephen Gleeson replaces Maikel Kieftenbeld. Offside, Birmingham City. Tomasz Kuszczak tries a through ball, but Clayton Donaldson is caught offside. Substitution, Birmingham City. Clayton Donaldson replaces David Davis because of an injury. Delay in match David Davis (Birmingham City) because of an injury. Attempt missed. David McGoldrick (Ipswich Town) right footed shot from the right side of the box misses to the left. Assisted by Kevin Bru. Goal! Ipswich Town 1, Birmingham City 1. Grant Ward (Ipswich Town) right footed shot from a difficult angle and long range on the right to the high centre of the goal. Assisted by Dominic Samuel. Substitution, Ipswich Town. Dominic Samuel replaces Brett Pitman. Krystian Bielik (Birmingham City) is shown the yellow card for a bad foul. Foul by Krystian Bielik (Birmingham City). Brett Pitman (Ipswich Town) wins a free kick on the right wing. Attempt missed. Nsue (Birmingham City) left footed shot from the centre of the box is too high. Assisted by Lukas Jutkiewicz. Foul by Nsue (Birmingham City). Nsue (Birmingham City) wins a free kick in the defensive half. Attempt missed. Ryan Shotton (Birmingham City) right footed shot from outside the box is just a bit too high following a corner. Attempt saved. Lukas Jutkiewicz (Birmingham City) left footed shot from the centre of the box is saved in the centre of the goal. Assisted by Craig Gardner with a through ball. Attempt missed. Brett Pitman (Ipswich Town) header from the centre of the box misses to the right. Assisted by Jordan Spence. Goal! Ipswich Town 0, Birmingham City 1. Jonathan Grounds (Birmingham City) right footed shot from the centre of the box to the high centre of the goal.